End Cottage at Low Shepherd Yeat in Crook, Kendal, Cumbria sleeps 4 people. Low Shepherd Yeat in Crook is surrounded by rolling hills and the glorious unspoilt countryside of The Gilpin Valley; Low Shepherd Yeat offers these delightful refurbished properties (refs UKC2940 and LK3 [Low Shepherd Yeat Farm]) on this former farm, and can be enjoyed together or individually in an idyllic setting. Low Shepherd Yeat Farm, (ref LK3 [Low Shepherd Yeat Farm]), is a superb, detached former farmhouse with a large, picture window and pretty countryside views. It has been extensively refurbished and redecorated and is perfect for families or groups of friends looking for space, comfort and well equipped accommodation to enjoy time together. The well-presented living accommodation includes a delightful dining conservatory overlooking the garden and fields beyond. The double bedrooms are comfortable and enjoy private bathroom facilities. A games room offers in house recreation for all whilst the hot tub is perfectly placed to enjoy the surrounding views. Shepherd Yeat End Cottage, ref (UKC2940), has been refurbished with careful attention to detail in order that the charm and character of this delightful former farm cottage is evident today. The property will suit couples, smaller families and friends looking for a comfortable, well equipped cottage in picturesque surroundings. The well-presented living room is enhanced by a wood burner, perfect for those cooler evenings when snuggling in front of the fire is the ideal way to end a day’s walking. French doors open onto the spacious veranda area wrapping two elevations of the cottage and allowing guests the opportunity to make the most of sunnier days. Glorious countryside views can be enjoyed from this elevated position – a delightful spot to enjoy breakfast al fresco or perhaps a chilled glass of wine at the end of the day. Sitting in 25 acres of picturesque countryside, Low Shepherd Yeat enjoys its own stretch of the River Gilpin with a stone bridge over the river. There are beautiful walks and cycle paths literally from the door, whilst the Lake District Fells such as The Langdale Pikes and the Old Man of Coniston are a short drive. Only 4 miles from Lake Windermere and Bowness with boutiques, galleries, tea rooms, pubs, water sports and ferries to Hawkshead, Coniston and the Grizedale Forest. Cruisers at Bowness offer trips round Lake Windermere, a more leisurely way to enjoy the wonderful scenery, calling at Ambleside to the north or Lakeside to the south to visit the fascinating Aquarium of the Lakes. Historic houses with lovely grounds such as Holker Hall and Sizergh Castle are nearby; don’t miss Muncaster Castle or the South Lakes Wild Animal Park at Dalton. Beatrix Potter, Wordsworth and other famous authors found the Lake District truly inspirational and there are many locations where their history and works are interestingly displayed. Nearby, the historic market town of Kendal has an art gallery, castle, theatre, larger shops and pretty walks along the River Kent. Whichever direction you walk or drive in this most beautiful area will bring you to breath-taking views of the lakes and mountains. The shop is 5 miles from Low Shepherd Yeat in Crook, with the pub and restaurant 1 mile from Low Shepherd Yeat. Properties can be booked together to sleep up to 12 people. End Cottage has a step to the entrance. Living room: With wood burner, 39’’ Freesat TV (basic package) and French doors leading to veranda. Kitchen/dining room: With electric oven, induction hob, microwave, fridge, freezer, dishwasher, washer/dryer and flagstone floor. Bedroom 1: With king-size bed and en-suite with shower cubicle and toilet. Bathroom: With spa bath, toilet, heated towel rail and some restricted head height. Oil central heating, electricity, bed linen, towels and Wi-Fi included. Logs for wood burner available locally. Welcome pack. Grassed area. Veranda with sitting-out area and garden furniture. Private parking for 1 car. No smoking. Please note: The property has a natural water supply from a borehole. Holidays at Shepherd Yeat End Cottage, Low Shepherd Yeat run from Friday to Friday. For a better idea of where Low Shepherd Yeat - Shepherd Yeat End Cottage is, you can see Low Shepherd Yeat - Shepherd Yeat End Cottage on the map below. 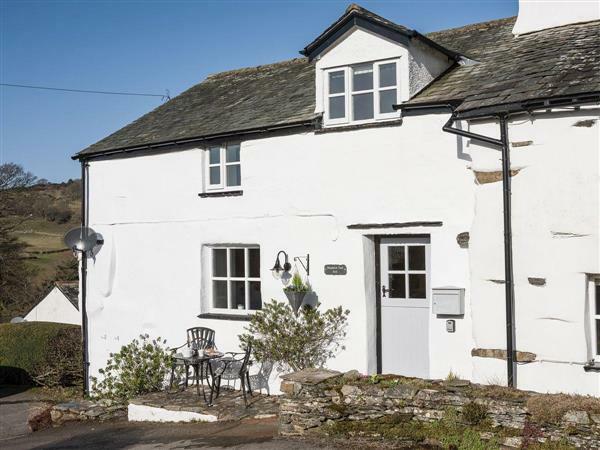 Low Shepherd Yeat - Shepherd Yeat End Cottage is in Cumbria; should you be on the lookout for a special offer, you can find all the special offers in Cumbria. It's always worth checking to see what is on offer at the moment. Do you want to holiday near Low Shepherd Yeat - Shepherd Yeat End Cottage (UKC2940), you can see other cottages within 25 miles of Low Shepherd Yeat - Shepherd Yeat End Cottage; have a look to find your perfect holiday location.